Beard Comb or Beard Brush? 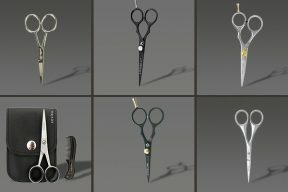 How to Choose the Best Tool? 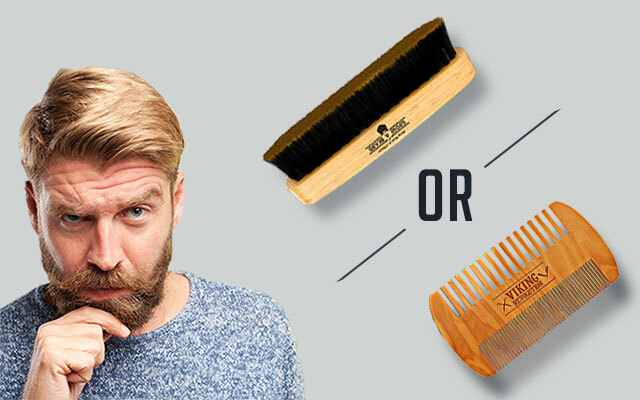 I know that when your beard has been growing longer a little bit, it’s time to consider which tool is more suitable – a beard comb or a beard brush? Also, is it essential to get a mustache brush as well? A lot of questions! So, in this article, I’ll spend some more time to dive deeply into these beard tools to let you the best answers for such frequently asked questions. And don’t worry, I’ll also include some of my favorite ones to let you have a great reference source. So, without further ado, let’s get straight into it! Okay now, when you first grow your beard, without reading this article, chances are no one going to tell you know that getting rid of bed beard or something like straightening is a matter. In fact, after about three to four months, you need to think about purchasing some beard tools to take care of it, like beard comb and brush for examples. Now, let’s dive into each of them! This feature is the most important thing that’s worth considering firstly. It’s perfect to opt for saw-cut wooden or rubber material because these types usually come in no seams and having teeth cut into the comb itself. These teeth and their ends are well-polished to deliver a smooth surface and working without snuggling or causing damages to your hair. 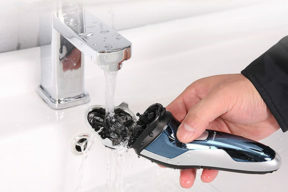 From that point, you should avoid the plastic beard combs, particularly those are made in machines with seams. 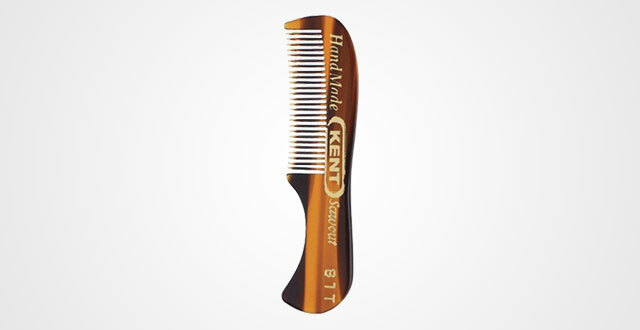 Among countless of brands specialized in beard comb, my top choice is Kent’s because not only are they made by saw-cut rubber material, but the quality is no joke – very high and durable. Meanwhile, these combs cause least damage within all combs that I have tried. Along with Kent, there are many other good brands like Hawatour, Baxter, Beardclass, etc. which I’m going to talk more detail in the next part. Don’t miss out! This feature is mostly based on the characteristics of your beard. Whether it’s thin or thick? Or is it straight or curly? If you have a thin, straight beard, congratulation! You’re one of the luckiest beardy guys in this world because this kind doesn’t ask much in beard comb. However, if you belong to the rest – owning a thick, long and curly beard – don’t fret, it just requires you pay some more attention to choosing the right beard comb. Remember to opt for 2-in-1 combs which mean a comb with half of them is wider teeth and the rest comes in narrower teeth. So, after washing your beard or once you want to comb it, use the wider edge first to detangle the hair and the narrower to shape it. Last but not least is comb’s material. 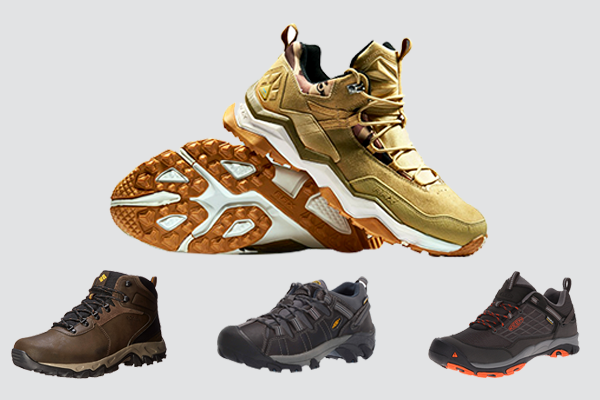 Basically, there are four main kinds of material – plastic, metal, rubber and wood. However, as I said above, the plastic isn’t my top choice. I don’t mean that you haven’t to choose the plastic. Truth to say, there are a few combs with high quality. However, most of them are quite cheap-made, attractive to molds, causing damages to your hair, and easy to break. If you still want to try plastic comb, I advise you to choose the high-quality in medium to high price range to be worth your beard and hair. This kind of comb is usually made out of cellulose acetate or vulcanite. Before diving harder to this material, let me ask you. Have your beard ever got any static electricity while combing? I used to! It’s frankly annoying, especially when you are styling or shaping it. But luckily, these rubber combs aren’t that trouble at all. Like the plastic, I don’t vote for these cool look-alike combs. Why? Because neither they aren’t anti-static nor friendly to your hair at all. Actually, the edges of metal combs are poorly cut that might cut open individual fibers. Wooden beard combs are the most popular kind on the market nowadays with a variety of sizes, shapes and designs. When it comes to choosing wood combs, one first and foremost thing to keep in mind is its quality. I mean the quality of the wood material because this feature will directly effect on the way its teeth is cut. As we all know that, comb’s teeth must go smoothly on the hair to detangle it without no hurt. 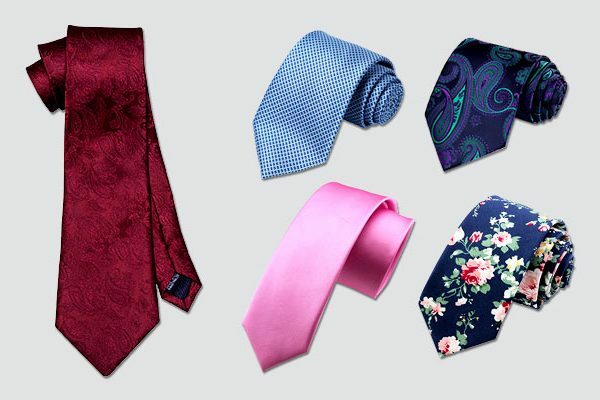 The only drawback of this material is its lack of water resistance so, I highly recommend you to dry clean it for the best durability and longevity. Is it necessary to get a beard brush? Before answering this great question, let me dive deeply into its pros and cons. But first, kindly make sure that hair brushes are totally different from beard brushes, not only for its sizes and shapes, but also for its material. Unlike most common hair brushes made out of manmade bristles, the beard brushes are made out of natural boar bristle hair. And in fact, I again don’t recommend you to opt for the plastic bristle brushes as chances will they break the hair and also, aren’t scalp-friendly at all. On the contrary, the natural boar bristle will do its best job in carrying the natural oil (also known as sebum) in your scalp to spread evenly to your beard. From that point, it’s like a safe way to improve your beard texture as this natural oil is particularly good for dry hair, making it softer and straighter. Along with that, natural bristle beard comb also helps to stimulate blood flow to relax your skin as well as encourage the facial hair follicle to grow better. The only drawback that I myself have found is it will make your beard caring process more complicated to one more step. However, with just little more time spending, the value you’ll get to your beard is totally bigger. So, it’s worth investment! The moustache comb is not easy for you to find out because most of people have a tendency to use a beard comb to brush it. However, a moustache comb is deemed cooler. It is quite difficult to find out a moustache comb which can meet all requirements in terms of size and quality. Most of the combs are used for beard instead of moustache. However, Kent 81T is a perfect choice for you. This moustache comb is very convenient with the appropriate size. Its dimensions are 6 x 1.7 x o.1 inches. Besides, the distance among teeth is close together, so you can brush your moustache easily. Although comb teeth are close, they will not pull your moustache because of their smoothness. This comb is hand – made from cellulose acetate material. As I mentioned above, I prefer this material rather than plastic or bamboo because it is both light and strong. I need a moustache comb which is small enough, smooth, natural, and fragrant. This comb met all my needs, but I wish that it has a blue color. The second beard comb that I want to introduce to you is a kind of wooden beard comb for its amazing quality along with the modest price. Getting a long, curly beard and I’m always crazy about it. Sometimes, when I need to go out, my beard doesn’t feel the same way. When I was a newbie, I once used to try trimming it, but it did not look neat as wished. Its appearance did not make me look masculine but instead, just like a hot mess, which was kind of disappointing. Although I tried to brush it, nothing changed until I decided to purchase this beard comb. And truth to say, I’ve never returned it. The bristle is so soft that does not hurt me brushing my beard. This comb is gentler than the hair comb on my beard. And now, I am no longer ripping out when brushing. To get such amazing performance, it’s a big thank you to the bamboo material as this isn’t harmful to beard and hair or scalp. Not saying that, the material is quite good and durable. It does not have the strange smell, by the way. This set has a boar bristle beard brush and a wood comb coming in the pocket size which are 4.3 x 1.4 x 2.2 inches. Not too small yet not too big, so you can hold it in your hand and sweep through your beard easily. The bristles of the brush are made from bamboo, too. I usually use it to massage my beard and stimulates the beard oil. Besides, using it to remove dirt isn’t a bad idea at all. This beard comb set is a great choice for sensitive skin. And importantly, they are inconvenient for those who have a very short beard because in some cases, they cannot keep your beard in control. To deal with this, my tip is applying some beard oil. Truth to say, I love this brush, but it’s kind of a little too soft. So, I highly recommend it is for thin and straight beard, instead of the thick. Another best beard brush that I think you should try is a Hawatour folding wood comb. 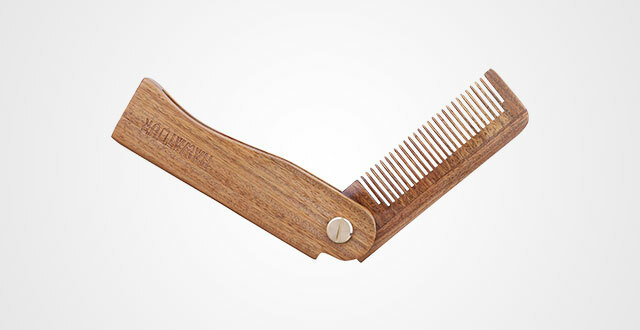 Same as the above, this beard comb is made from green Sandalwood which is 100 percent of natural materials. The colors are various, from light to dark color. Additionally, these materials are able to changes the color when exposes to the sunlight. Compared to bamboo, beard combs made from sandalwood materials are better in durability and firmness. They also have a natural smell to help you reduce tensions and stay relaxing. As mentioned many times, I don’t like beard combs that are made from plastic. Although they are light, these combs hurt me a lot. But when it comes to this beard comb, that’s not a matter at all. It’s arguably the best beard comb for men in terms of price and quality. 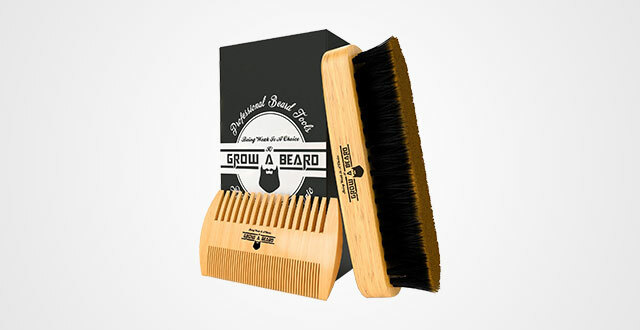 The wood bristles can reduce breaking and damaging the beard significantly. Also, its surface is smooth and there are many bristle sizes to ensure to suit with all kinds of hair style. The comb is a kind of folding comb, so you can fold it when not in use and put inside your pocket. Moreover, the head of the comb looks like a dove’s tail, which is quite attractive to nail your style and hook the surrounding attention. Another reason why I pick this Hawatour is its performance. The Sandalwood teeth are quite smooth and I love its great sandalwood smell. At first, the scent might be a little so strong, but if you use the comb for several times, it will be lighter. I see this comb is quite comfortable, compared to other beard brushes that I saw before. 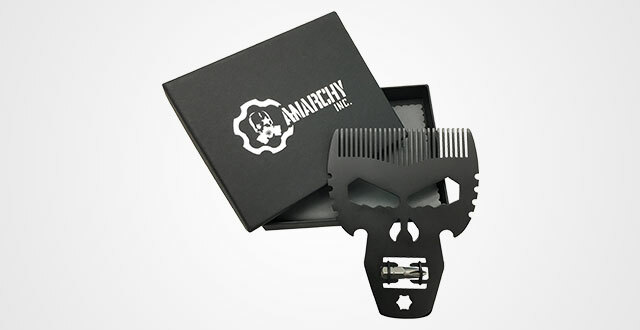 Everything about this beard comb is good, but I just do not like its metal bolt because sometimes, it snagged on my beard. If you are not careful, it may hurt you. But, for the price, it’s worth a try! If you are looking for the best beard comb to shape your beard, this is exactly for you. At first, I just wanted to find a comb to control my beard; however, I found a comb which could exceed all of my expectations. This beard comb is beneficial and multifunctional for sure. It can keep the beard neat at all the time while be friendly to users’ health. If you have any problems with circulation, this comb can solve them smoothly. Furthermore, it enables to stimulate the growth of your hair and beard. But the best thing is NO CHEMICALS. You will not feel the uncomfortable smell or feeling itching and flakes while using it. Some of my friends do not want to use a beard comb because they think that it can be clogged with the beard and the comb teeth may be broken. However, mine still works greatly without any broken tooth. 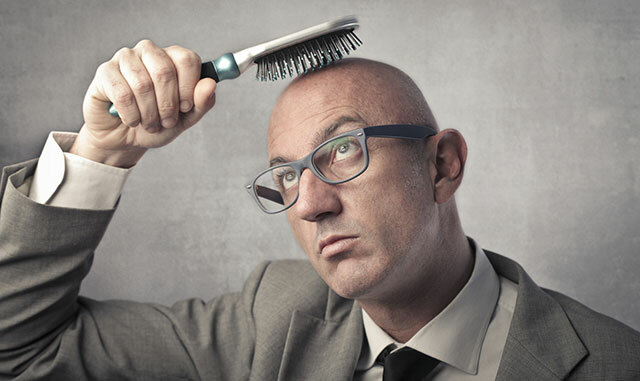 All in all, this comb is the best choice for those who have short and thin beard. If you have thick and long one, chances to consider carefully. This beard brush is awesome! Although its price is quite competitive, its quality is not cheap made at all. Full-black packaging, impressive handle design and amazing quality. If you ask me if it’s worth a try, that’s definitely a yes from me. This beard comb is made from alloy which consists of many thermal conductive properties. It will work well, if you warm it up in the hot water before using. The comb’s teeth are also made from alloy and they are firm enough to make my beard smoother. But importantly, they do not cause pain while brushing. Another good thing is its light weight with only 3 ounces. Besides, the color looks quite masculine with full-black performance. Furthermore, it has an impressive handle that can help you create many different styles. With the unique design – cool and eye-catching, I believe that you will like it right at the very first sight. To get better result, you can use it with the beard oil. I always prefer beard combs which are made from natural materials such as bamboo or green Sandalwood. This comb is not an exception! Its material is from the nature and the smell is very comfortable, even if you put it close to your nose, its Sandalwood scent will surely calm your mind. This comb is curved on both sides to help you create many beard styles. It is an excellent choice for those who have long beard. Its teeth are made from Sandalwood, too. Therefore, they are smooth and do not cause pain or breakage while combing. 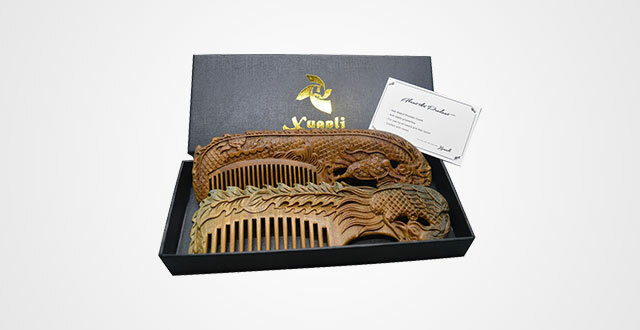 Particularly, the comb is exquisitely carved with different patterns, such as dragon, flowers, etc. 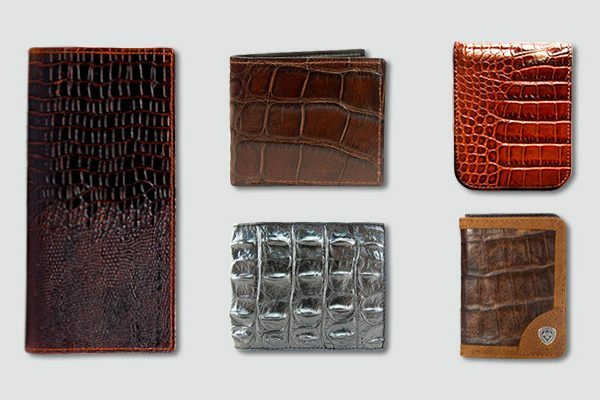 You can choose the shapes and textures that suit to your personality the most. 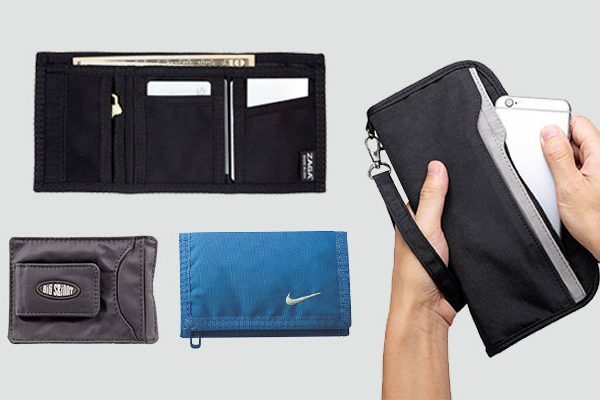 Moreover, it comes in very compact design, only measured by 6.9 inches in length and 2.16 inches in width. Have used this comb for nearly 2 years, and up to now it still has been worked greatly. If you own long and thick beard, go no further than this choice. 7. 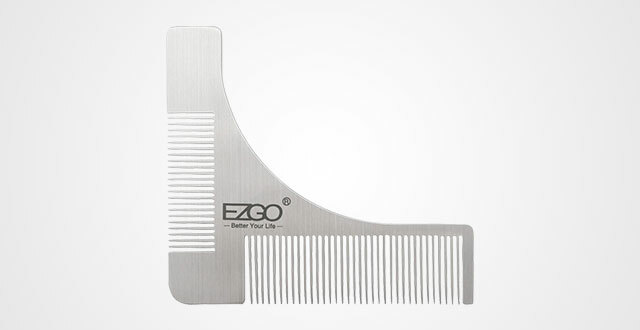 EZGO Stainless Steel Beard Styling and Shaping Template Comb tool for Perfect Lines & Symmetry. The next best beard comb that I am going to recommend you is the EZGO stainless steel beard styling and shaping template comb. If you want to grow the thickest, fastest and fullest beard, you should buy this combo. The comb is affordable and its quality can make all people satisfied. It has two sides which can help you take care of your beard totally and effortlessly. Besides, you needn’t buy any other combs for your mustache because this tool can work well on both. Not saying that, if you are using the beard oil, it can help you to glide it through the beard. In terms of material, EZGO’s is made from premium stainless steel which has some outstanding features, compared to both plastic and bamboo. While the plastic and bamboo combs are easier to be broken, this material won’t be a matter at all. It is long lasting! Meanwhile, the comb teeth made from plastic and bamboo are sharper and they can scrape your skin, but again, this comb solve that problem easily. It allows you to shape and style your beard without painful, for sure. Besides, no body can’t deny its handiness, neither. Measured by 3.9 inches in length and 4.33 inches in width, this comb is quite compact, if not saying that it’s rather small. You can keep it in anywhere you want. Its light weight is also a plus point that I choose it, not others. This comb works perfectly and is easy to use. There is no mistake made. Both sides still work well until now. However, one thing to bear in mind is that because the comb teeth are close together, this comb might be a bit difficult to clean it with just a piece of cloth. Instead of that, you can take the use of your toothbrush. This works more efficiently. Baxter of California comb is not a strange brand name for beard comb buyers. One of my friends recommend this for me when I said that I need a beard comb. I think it is equal to what you pay for. The price is quite reasonable, compared to its quality. This Baxter is made from cellulose acetate which is a kind of natural material. Not many combs made from cellulose acetate are sold on the market, nowadays. As mentioned above, bamboo and plastic combs are sharp and breakable, however, the cellulose acetate is light, durable and supple. For those who are wondering about its dimensions, they are 3 x 4 x 2 inches. 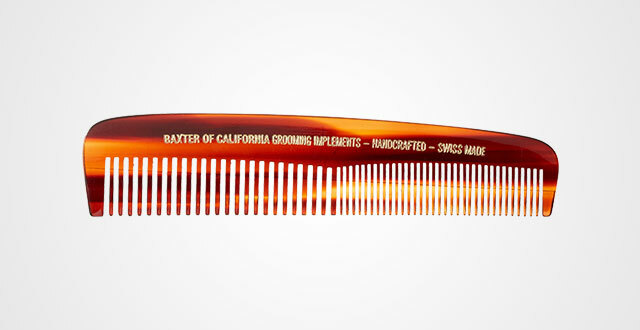 Baxter of California comb is a kind of Swiss-made comb which is designed in California but made overseas. 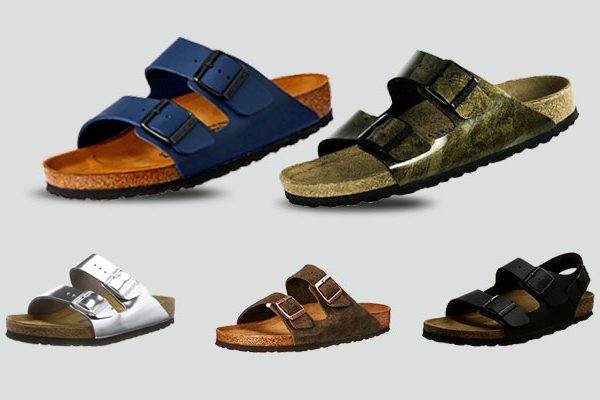 I love its well-made handcraft to value your money as well as provide the maximum grooming comfort. To make the rounded tip and tapered teeth comb, it needs 12 steps of manufacturing. Each tooth comb is made carefully and not scratched. In fact, I don’t feel hurt with this baby while combing. This beard shaping comb is a good choice and I’m very pleased with its durability. There come two sides, one with the small teeth, and the other with the bigger ones. They all work well. The comb teeth contribute to massage my facial skin. I felt completely comfortable when using it. Although it is the best beard comb within such price range thanks to its good shapes for beard, I just hope that it can be a little bit bigger because the comb is quite small in my hand. 9. 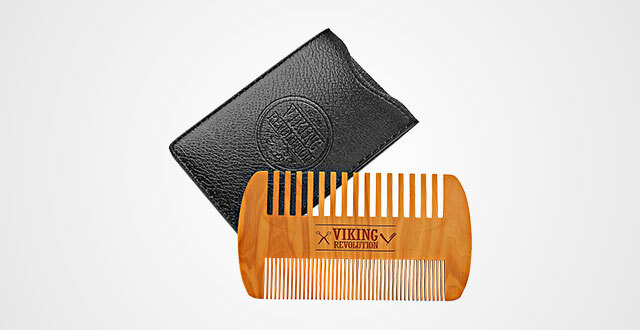 BEST DEAL Wooden Beard Comb & Case, Dual Action Fine & Coarse Teeth, Perfect for use with Balms and Oils, Top Pocket Comb for Beards and Mustaches by Viking Revolution. I’m sure that you cannot ignore such a wonderful Kent beard comb. The more trying it, the more you ask yourself why didn’t to buy it earlier. There are many excellent features. Firstly, it is made from natural pear wood. 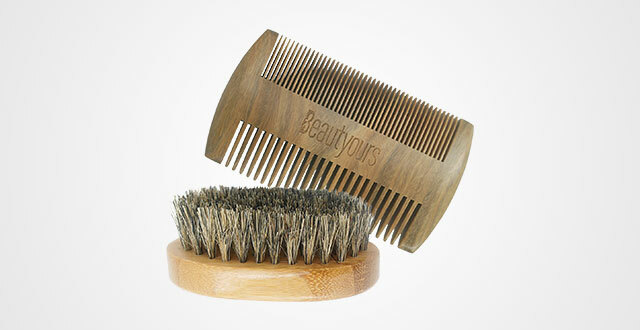 Different from plastic combs, the wood comb will not make you hurt, but instead, an amazing comfort. Besides, the sharp teeth of plastic comb can pull your beard, but the wood won’t. You can use this to take out of the knots easily and smoothly. It is much more special than other beard combs because it has coarse and fine teeth. This dual sided comb will provide you the best grooming experience. Particularly, it will not pull or snag your beard. Because of its two-side design, the comb is suitable for all types of beard, short or long, and thick or thin. Using beard oil and balms are also good ways to be more attractive and easier to shape your beard. Besides, they are helpful to make it grow faster. The pear wood comb is perfect for applying these things as it can help to absorb quickly and effectively. 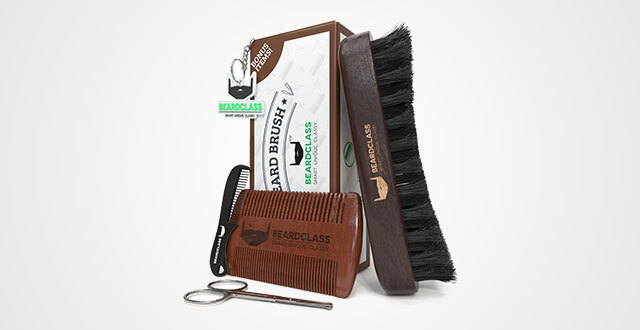 The last beard product that you can refer here is the BEARDCLASS beard brush and comb. This set comes with a lot of gifts included, such as mustache comb, scissors, and brush. I am pretty satisfied! If you are growing a beard for the first time, this set is very useful to help a lot in shaping and making it neater. The comb is actually what I’m looking for. I grew my beard, so a full set to take care of it is essential, such as a scissors, beard comb, moustache comb and brush. The brush is really awesome with the contoured shape that makes me feel great when using. Meanwhile, the scissor is suitable for my beard. This tool is sharp enough to cut and shape it. Both moustache and beard comb are excellent. They are made from Sandalwood. The beard comb is the dual sided one, so it is useful for short and long beards while the moustache has narrower teeth to take care of your moustache better. I can organize it as I want. Now, for those who are in midst of growing beard, I’m going to guide you how to comb it. Easy, when beginning this task on the morning, hold your comb with its teeth facing up then, comb outwards your beard. Remember to start from the neckline and move gradually to the chin. Its purpose is for separating all of your hairs to let them lay on each other as well as come in fluffier. With thin, short and straight hair, this task is as easy as a piece of cake. On the contrary, with the curly, thick and long beard, start with the wider teeth edge to detangle it. Then, move to the narrower side to style it. Once hitting a snag, just gently comb and detangle the hair, don’t use too much force and try to pull it down because chances might your hair split out. The same way with your jaw line and also, don’t forget to comb it upwards and then brush down by a beard brush to style it. Now, how about your mustache? Brush it outwards from the center, fanning it out and away from your mouth. Easy, right? Beard comb & Beard brush – When to use them? After acknowledging about beard comb and brush, chances might you wonder that when to use them, right? Actually, this is another common frequently asked question and in fact, this issue is due to the current stage of your beard growth. Thus, my answer is going to be a little more complicated than what you expected. Truth to say, there are two major cases to require using a beard brush – it’s when your beard is still too short and thick to let combs work on and second is when you need to soften it. Now, clearly, you will see that in the beginning, beard brushes aren’t utilized for shaping purpose, but for caring process. As mentioned above, the natural bristles in beard brushes play an important role in spreading sebum across the hair to smoothen and straighten it significantly. The more you brush, the softer your beard is. Or, you can call it as a natural beard softener as well. Based on the above purpose, beard brushes are also used for applying oil or balm to the hair. 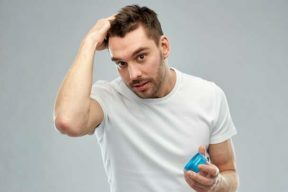 Same thing like when it carries the sebum, beard oil and balm will evenly spread across the hair, cover those spots that might you miss when applying by fingers or beard comb. Another good thing about using beard brush is when applying oil, you can carry on many kinds of techniques. Either you apply it directly on your beard or pour oil on the brush, the result will surely please you. Another amazing benefit of brush that beard combs or your hands can’t do is cleaning your beard throughout. As after a long day, both your hair and beard has been collection countless of dust and dirt. That’s when you need to remove them off your beard, making it soft and clean again by a good beard brush. Thanks to this tool, you needn’t wash your beard as regularly as usual. I’m not joking! Just brush your beard daily and counting down the times needed to wash it. same result! Now, after reading the above section, chances can you guess a little bit when to use a beard comb, right? True! That’s when your beard is long enough to have your fingers brush through it as well as the comb, usually from the 3rd to the 5th month after you stop shaving your beard. Particularly, after the 5th month, a beard comb is deemed more useful to detangle, styling, blow drying, cutting and trimming. Besides, opposite to the beard brushes, this tool can be utilized in both wet and dry hair. Not only your hair, but long beard will be tangled as well. And the best time to detangle it is right after you wash it and the hair is still wet a little bit and soft. 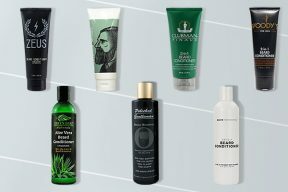 Deemed a small issue, however, it’s important to help your beard stay well-shaped in longer period of time as well as make those beard products applied more efficiently. I’m not saying that you can’t go with a dry beard, however, chances it will be a little bit harder to style it and your beard shape won’t last that long. As mentioned earlier, choose those combs with two types of tooth width – the wider and the narrower. Start with the wider and after detangling your beard, change to the narrower edge to style it. If you are owning a short beard, this might not be a big matter to you. HOWEVER, with a longer one, a right beard comb will promote its benefit more. When applying beard wax or gel, there are two ways to style it is either by your hands or by a beard comb. But in my opinion, it works better with the comb as every single hair will straighten significantly. Like killing two birds with one stone, this is another amazing way to both make your beard dry and straight it neatly and in shape. Besides, by using a beard comb to blow dry, the hair will be softer as they are continuously stroked and combed. As you can see it in barber shops, the professional barbers usually combine a beard comb with their scissors to cut and trim beard. You can learn this useful and easy technique, too. By using a beard comb, you will get more control to groom it accurately, particularly when your beard is curly and thick. On the very first stages of your beard growth, like month 2 to 3, utilize a beard brush is more efficient to take care of it. Since the month 5 to infinity, change into a beard comb is essential to help you detangle and style your beard better. But, either using comb or brush, you need to have your beard brushed/combed at least twice a day. I totally understand that it’s impossible to wrap all knowledge about beard comb or brush in just one article, but glad to tell that, I’ve provided all essential and must-known information in this guide. Hopefully, after reading it, you finally have a good idea in which one to select – beard comb or beard brush. Good luck!